The smart mining market has been segmented into five regions: North America, Asia Pacific, Europe, South and Central America, and Middle East and Africa. Asia Pacific was the largest market for smart mining in 2016. Asia Pacific was followed by Europe and North America in 2016. The market in Middle East & Africa is expected to witness significant growth in the near future due to rapid economic development along with increasing mining activities in many African countries. Increasing use of IoT solutions in several countries such as China and India is propelling the market for smart mining at a significant rate. 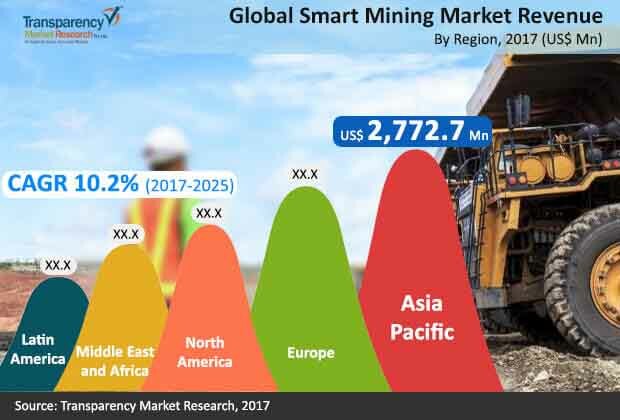 Key players in the smart mining market are Rockwell Automation, Inc., SAP SE, Trimble Navigation Limited, HEXAGON, STONE THREE MINING PTY LTD, SYMBOTICWARE INC., Alastri, IntelliSense.io, ABB Ltd., Atlas Copco, Caterpillar Inc., Hitachi Construction Machinery Co., Ltd., Joy Global Inc., Komatsu Ltd., Sandvik AB, Cisco Systems, Inc., and Alcatel-Lucent.